Organizational problems are sometimes difficult to assess and solve. 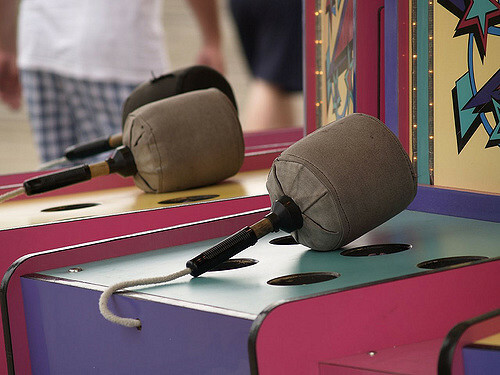 Leaders often feel like they’re playing a game of whack-a-mole, trying to whack whatever the most glaring problem is at the time. But, have you ever noticed the issue with this approach? As leaders, we tend to use the same tools to attack the same problems time after time. Or, we push on one problem, only to see another rise in a different area. Peter Senge, senior lecturer at the MIT school of management, was bothered by this common phenomenon. He researched the topic and wrote a book in response called The Fifth Discipline. The big idea is that some organizations are able to learn, grow and improve when facing challenges while others run into the same problems again and again. He notes five disciplines necessary for an organization to push past their common problems. They are systems thinking, personal mastery, mental models, building a shared vision, and team learning. He believes all five disciplines must be present and working together for an organization to truly be considered a learning organization. The core principle of the book is systems thinking, also known as the fifth discipline. Systems thinking is about increasing a company’s awareness concerning what’s really causing any organizational issue. I love this book and believe systems thinking is the puzzle piece missing in many organizations, keeping them from taking meaningful steps forward in their organizational growth. I’d like to share a few “laws” of systems thinking from Senge’s book. One common criticism of the recently passed tax reform bill is that some of the individual tax cuts run out after a certain amount of time, while other tax cuts are permanent. Some “solutions” merely shift problems from one area to another, without actually solving the actual problem. When church attendance is down, a church will push for more marketing or initiate an invite a friend campaign. This solution may work in the short-term, but it ignores the possibility of factors contributing to overall attendance loss. Marketing is important, but the more important question is, why don’t people want to stay at your church? Senge writes, “Pushing harder and harder on familiar solutions, while fundamental problems persist or worsen, is a reliable indicator of non-systematic thinking – what we often call the ‘what we need is a bigger hammer‘ syndrome” (1990, p. 61). Organizations can often act like the three blind men encountering different parts of an elephant. Each describes an elephant’s size and shape based on the part of the elephant they’re encountering. In an organization each area believes they truly see the true cause to every problem. But, the issue is none see how their own area’s policies and procedures interact with the system as a whole. Everyone is a part of the system that has created the problem. System problems require systems thinking. When facing your next organizational issue, be cautious before running to familiar solutions. First, take time to consider the true cause of the problem. Sometimes growth will happen by simply taking away the things limiting growth. Using the church growth example, instead of pushing harder and harder to invite more people to church, it’s possible the church will grow if factors limiting church growth are addressed- like lack of friendliness, lack of next steps, no connection for first-time guests etc. In his show Dr. Phil often uses a famous quote from Rita Mae Brown, “Insanity is doing the same thing over and over again, but expecting different results.” Doing more of the same thing you’ve always done to solve familiar problems will not give you different results. When facing your next organizational problem, maybe it’s time to trying thinking differently. What do you think keeps organizations from identifying the true cause to their issues? Feel free to comment, share, or subscribe.